At the south end of the site the works connect the new Western Concourse to a new taxi rank canopy and pick up point via an interface with the Great Northern Hotel.;. 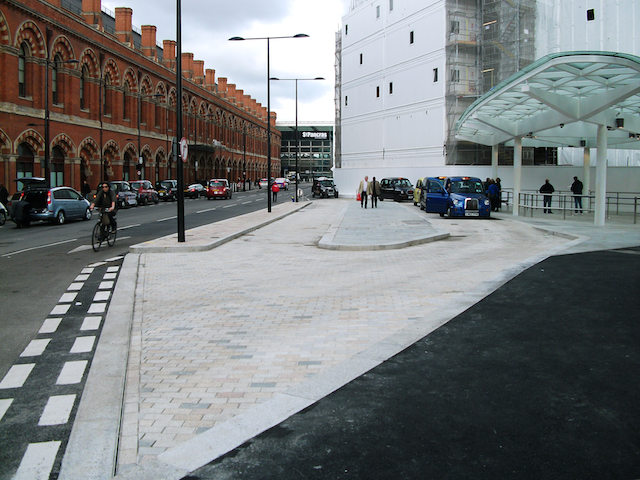 The works include new access and egress points on to Pancras road for both taxi points including re-grading of the existing Pancras road surface construction. New street furniture and street lighting throughout the scheme installed. King’s Cross Station Redevelopment Package 6 – which includes all the external civil and hard landscaping works to the new Western Concourse (WCC) and its magnificent domed roof as well as the refurbishment of the historic Western Range Building – will ensure that King’s Cross Station is fit to serve London for many years to come.